The Tea Phactory is the joint effort of a mother and daughter who want to share our love of tea with you! Fascinated by all the wonderful flavors, health benefits, and uncomplicated pleasures tea has to offer their experience has shown that brewing the perfect cup is as personal and unique as each type of tea. Whether you prefer the gentle sweetness of white tea, a rejuvenating green tea, or the robust flavor of black tea, Tea Phactory offers an artful selection of familiar favorites as well as Rooibos, Yerba Mate, and many herbal blends. 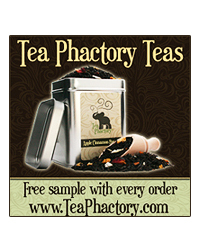 Currently the Tea Phactory is offering a Free Tea Sample when you place your order online. Check out the available Tea Phactory Tasters to treat yourself or someone you care about to the world of loose leaf tea and herbals. Each pack contains seven different teas or herbals with enough to make two-four 8 oz. cups, depending on the variety.